Q. What do you call an Aggie five years after graduation? A: Boss. It then dawned on me as I skimmed through Inc.com’s aforementioned best-boss attributes that, by virtue of staying in Aggieland after earning my Texas A&M degree, the majority of my bosses have been Aggies. I’ve learned a lot from each of them, with the good far outweighing the bad. None more so than Dean of Science Joe Newton, my first thought in reading 21st century tips on how to manage like a boss. Dr. Newton is a rare bird, and not just because he lives in both hemispheres of his brain (while I struggle on good days to function in one) and can flit effortlessly and eloquently from side to side and throughout all neural synapses in between. Admittedly, I’m biased, but I happen to have one extraordinary boss who trusts me enough to let me do the job he hired me to do (not once but twice, but that’s another story altogether.) Novel yet seemingly terrifying concept for some people both ways, not to mention one that speaks volumes in a unit where professional expertise is king. And yes, we have fun doing it! 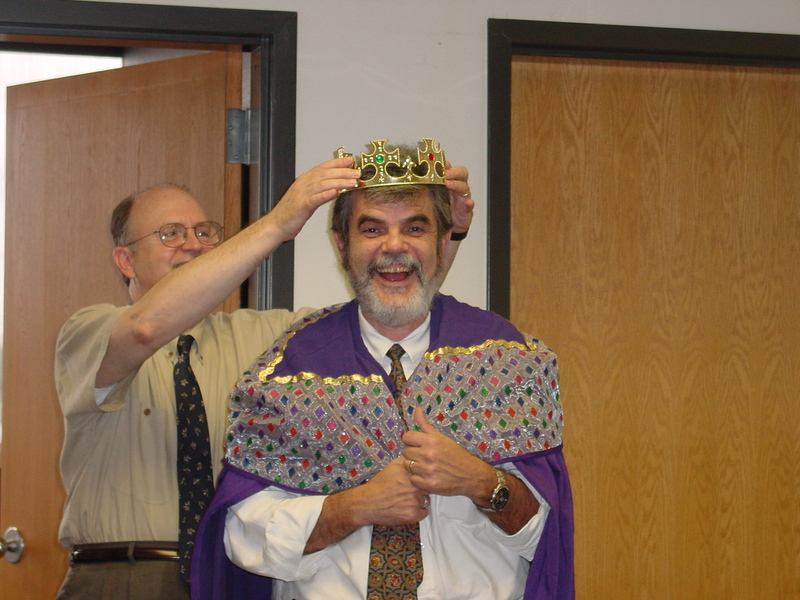 Dean of Science Joe Newton, being “crowned” by Executive Associate Dean Michael Hall in 2002, when he officially became Dean of the College of Science at Texas A&M University. In January, Dr. Newton celebrated his 15th year of service as a member of the Texas A&M Science Dean’s Office. In my high school days, Mom once jokingly (at least I think) threatened to get me a copy of the classic poster featuring a pig and the slogan “You are a product of your environment.” Here’s hoping she was right and that I have another 20 years or so to absorb, evolve and enjoy! This entry was posted in General and tagged best bosses, expertise, higher education communications, leadership, management, mentorship by Shana Hutchins. Bookmark the permalink.